The StealthSwitch II FS-2 Slave footswitch is one of 4 optional foot switches. Up to 4 slave switches are supported by the StealthSwitch II and are fully programmable in both Windows and Mac. The FS-2 has a louder click sound than the FS-1, yet provides tactile feedback to the user. 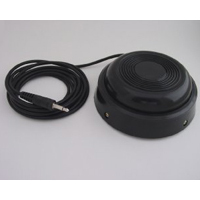 Made of ABS plastic, this footswitch has a 6' (1.8 m) long cable that terminates in a 0.125" (3.5 mm) mono plug and requires about 0.125" (3.5 mm) to activate. 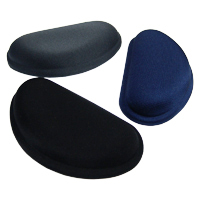 When employed correctly as a palm support, the Softworqs PlusPad provides a resilient palm support which still compresses sufficiently to eliminate pressure points beneath the palm (or heel of the hands). At 5" wide by 2.75" deep, the area is sufficient to allow even very large hands to rest when positioned in the middle. PlusPads are ideal for use with touchpads where the palm can rest on a slightly elevated (0.75" high) support and let the fingers curl down to the touchpad surface. The gel core is covered with low-friction Lycra that permits the hand to move across the surface with minimal effort. The underside of the PlusPad is an anti-skid material that keeps the pad in place on the worksurface.